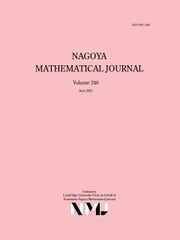 The Nagoya Mathematical Journal is published quarterly. Since its formation in 1950 by a group led by Tadashi Nakayama, the journal has endeavoured to publish original research papers of the highest quality and of general interest, covering a broad range of pure mathematics. The journal is owned by Foundation Nagoya Mathematical Journal, which uses the proceeds from the journal to support mathematics worldwide.